The Olympic spirit is best expressed as : "The most important thing in the Olympic Games is not to win but to take part, just as the most important thing in life is not the triumph but the struggle. The essential thing is not to have conquered but to have fought well." 2016 Summer Olympics, officially known as the Games of the XXXI Olympiad, and commonly known as Rio 2016, is all set to begin formally today. All 206 National Olympic Committees have qualified at least one athlete. As host nation, Brazil has received automatic entry for some sports including in all cycling disciplines and six places for weightlifting events. Rio Olympics are the first games in which Kosovo and South Sudan are eligible to participate. During the Parade of Nations within the Rio de Janeiro 2016 Summer Olympics opening ceremony, athletes and officials from each participating country will parade in the Maracanã Stadium preceded by their flag and placard bearer. Each flag bearer has been chosen either by the nation's National Olympic Committee or by the athletes themselves. In keeping with Olympic traditions, Greece will enter first, while Brazil, the host nation, will enter last. There will be South Sudan too, the 206th member crossing the final hurdle to competing at the 2016 Rio games. All is not well with the youngest Nation, as its athletes have trained without being able to live in peace and able to have their food properly. In accordance with the Olympic spirit, the games are not only about those striking gold – away from Usain Bolt, there will be some dreaming to challenge, dethrone and win medals. In the blocks for the start of the 200 metres at the Rio Olympics, Mangar Makur Chuot dreamt of carrying on his back the name of the newest nation on Earth and, on his chest, the name of one of the men who helped liberate it.Chuot’s father, Makur Chuot, was a chief and a judge in his village, in what was then Sudan, a country stricken by near-constant drought and riven by a brutal, intractable civil war. When Chout was four a raid on his village by a rival faction saw his father murdered in a hail of bullets. Two decades on, Chuot is now a dual citizen of South Sudan – the country his father died for but whose emancipation he never saw – and Australia, the adopted country he arrived in as a refugee.Chuot belongs, he says, to both places. His story was the first in Dear Australia, a series of films by the Guardian charting the lives of refugees in Australia – telling their stories, recognising their contributions, understanding better the trials and tribulations that attend being forced from home. Mangar is quoted as saying that he will carry his father’s name on his chest when he runs in the Rio Olympics. “It is for the honour of him. In our tradition in South Sudan, this is how it works. I’m Mangar, and my surname is my father’s and my grandfather’s names, MakurChuot. He was Makur ... it’s our role as boys to carry our ancestry, to carry the name.” He almost achieved his dream – almost !! – because – sadly, the South Sudanese refugee who rose from a refugee camp to qualify for the Olympic Games – was controversially de-selected by the South Sudan team, without explanation a week before the Games begin. Chuot, now a dual Australian-South Sudanese citizen and based in Perth, Australia, is the reigning South Sudanese national champion over the 200-metre sprint and he holds the national record in the event.He was the Australian national champion over 200m in 2014, but in 2016 had chosen to run for his homeland at the Rio Games, in honour of his father, Makur Chuot, who was killed during Sudan’s bloody civil war.His personal best time – 20.76 seconds – is just 0.26 outside the automatic Games qualifying time. 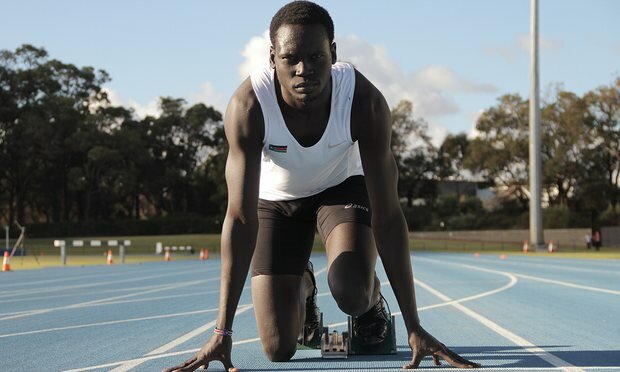 In December last year, Chuot was officially informed by the South Sudanese Athletics Federation that he would be competing for South Sudan in the country’s first Olympics and was issued athlete’s accreditation to the Rio Games also. With just a week to go, an email informed him that it might be possible for him to attend the Games as a coach or official, but that he would not be competing, stating that he was rejected by the country’s Olympic committee. South Sudan however is sending - three athletes to the Rio Games: 16-year-old Santino Kenyi in the men’s 1500m; Guor Marial, a 33-year-old based in the US who will run his second Olympic marathon after competing at the London Games under the Olympic flag; and Margret Rumat Rumar Hassan, a 19-year-old sprinter who will run in the women’s 200m.Five more South Sudanese athletes, currently living in Kenyan refugee camps, will compete in Rio as part of the first refugee team. The Guardian has confirmed that Chuot’s coach Bunn has lodged a formal complaint to the International Olympic Committee alleging possible corruption in the selection process. South Sudan which won its independence in 2011, has been a troubled independence, of neither peace nor prosperity. The country remains benighted by famine and drought, and this month, internecine violence has resumed. South Sudan has almost no sporting facilities and few people who might use them. Generations of children were forcibly conscripted into armies instead of being taught to play games. In parallel with his new nation, Mangar Makur Chuot had experienced one of the most unlikely rises to an Olympic Games of any athlete. South Sudan’s first ever Olympic Games team is in disarray over allegations an advertising deal influenced which athletes were selected to compete at Rio.The secretary-general of South Sudan’s National Olympic Committee, Tong Chor Malek Deran, has said in correspondence with athletes, and in interviews, that he felt pressured to choose one of those athletes, sprinter Margret Rumat Rumar Hassan, because she was the centre piece of an advertising campaign for Samsung, despite the fact she was not the fastest runner in the country ! Pathetic state of affairs and one feels sorry for Mangar Makur Chuot.